To celebrate National Chocolate Lovers Month, I am partnering with Cost Plus World Market to bring you some cocktails so indulgent they could be considered Dessert! 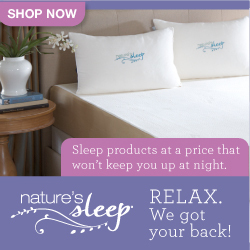 Thanks Cost Plus World Market for Sponsoring this Post. All views are my own. It is National Chocolate Lovers Month! UM YES, PLEASE! 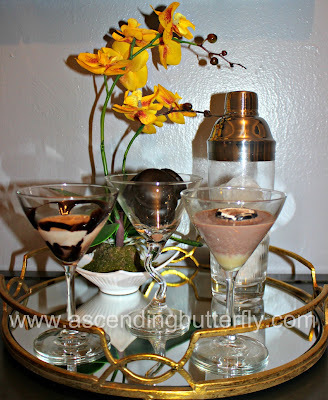 I love chocolate and I am no stranger to sweet cocktails so I thought I would combine my love of both and bring you two of my favorite Martini's - a Dark Chocolate and a White Chocolate Martini. Perfect for your Valentine or Galentine, or a fun Star Wars Viewing Party - Set out your Martinis and let your friends choose the dark side or the rebellion! A lot of my barware has been those cool commemorative glasses you get at restaurants or bars for ordering a specialty cocktail, cute, but all branded for different places. Not quite the sophisticated set up. I wanted a more sophisticated bar area with the challenge of being in a super small space, so I converted one of my favorite Cost Plus World Market sideboards into a bar on the inside, I bought a wine rack to put inside the sideboard where I could store wine and spirits neatly and also include my barware. I purchased a mirrored serving tray and my very first set of matching NON-BRANDED Martini Glasses! Chocolate Martini's are indulgent, decadent and as sweet as you want them to be, remember to dim down the sweetness and add more 'pow' to the drink you just need to up the amount of Vodka used in the recipe. Above: Even though I refrigerated my Torani Dark Chocoloate Syrup prior to working with it, it definitely started to melt down fast when the vodka hit the glass and my cute design got kind of melded together, I also formed a heart with the dusting of cocoa powder! The White Chocolate syrup also sort of pooled to the bottom so it is a bit hard to see. A lot of folks like to line the top of the glass and rim it with the chocolate sort of like a margarita, but I can tell you if you are wearing lipstick or lipgloss you do NOT want that! So start your chocolate swirl pattern what I call 'lip length down' so you don't get the sauce on your lips with each sip. Unless you are wearing a truly bulletproof lip stain that won't budge every time you lick your lips. Above: Press on the photo above to make it bigger, and it becomes a printable, you will also find this on our pinterest page in the cocktails anyone? board HERE. 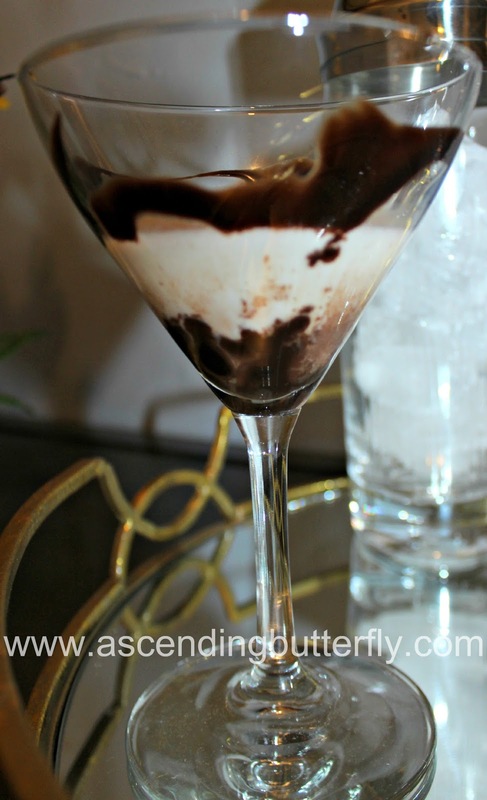 I post one recipe, because the substitution is simple, for a darker effect you use more chocolate liquer, and for a lighter chocolate martini, you can eliminate the chocolate liquer or use it in a lesser ratio and/or just use the baileys. If you notice I wasn't specific with the Vodka brand or the chocolate liquer brand because that really amounts to personal taste, most bartenders use Vanilla Flavored Vodka and I am not a fan of it so I use a regular vodka and let the liquer (Godiva is really good) and the Baileys give it the taste profile. Remember your syrup (I prefer Torani) which you are using for decoration, drops to the bottom so it flavors the drink in its own way as well. I do however get specific with the Baileys, it adds such a smooth, rich flavor, and the torani syrups say 'coffe house flavor' but it is NOT overwhelming and it adds such a richness to the drink. With the Dark Chocolate Torani Syrup being a stronger flavor profile and the white chocolate syrup much sweeter. I personally freeze my vodka so I know it's cold when I am ready for it, but you definitely want to add a lot of ice to your shaker, this drink is best served and consumed while it is still super cold. All the elements used to create this recipe, from the sideboard that I converted into a bar, the mirrored serving tray, glasses, syrups and shaker are included below! Above: I fell in LOVE with this sideboard when I attended the Grand Opening of my local Cost Plus World Market in New York City - 620 Sixth Avenue, New York, NY 10011 in Manhattan's trendy Chelsea area. I had already been eyeing them on the website but seeing them in person definitely put it over the top for me! I fell so much in love, that I ordered two. But I recently decided to repurpose one of them and because I live in a super small space, this is now my foyer entryway table that blends perfectly into my modern zen décor, but the inside is all barware and bottles as I purchased several racks to go inside of it. It is incredibly spacious on the inside, and once I lived with them for awhile in other rooms I realized that several actual 'bars' I had been researching for that space were no where near as spacious and I love that when it is closed you can't tell I am using it for that purpose. So double perk. I also love using this piece to stage my product photos, and the chocolate martini's were put out on this sideboard. Above: The Dark Chocolate Sauce by Torani has a bolder less sweet flavor profile than the White Chocolate Sauce and is also delicious, you can definitely use this on other stuff and trust me when I tell you that you will. You will find excuses to drizzle it on almost everything! Once you try this one you won't go back to your regular brand. Above: I always read reviews before I purchase ANYTHING, and the reviews on these were quite positive and I can see why. They are a great value for the money, they are sturdy, definitely not thin or cheaply made, and make a great presentation. I also like using martini glasses for small snacks during a party for an elegant presentation as well. And I have always considered them the glass to present shrimp cocktails in. Above: I Love this one so much I plan to order another one for my Vanity! It is perfect for all kinds of staging and presentation! Above: To mix the perfect Martini every time you want a good cocktail shaker! also know you guys like non-alcohol alternatives, so I just can't help but to share the amazing post by Laura Leigh on her blog Louella Reese where she creates a copy cat Frozen Hot Chocolate Recipe inspired by wildly popular ones at Serendipity restaurants in my hometown New York City! You can pick up all these items at your local Cost Plus World Market location (I am linking you directly to the store locator) or online and they are currently having a sale for 25% off Valentine's Day Shop Food Favorites so you can nab yours for a great discount! 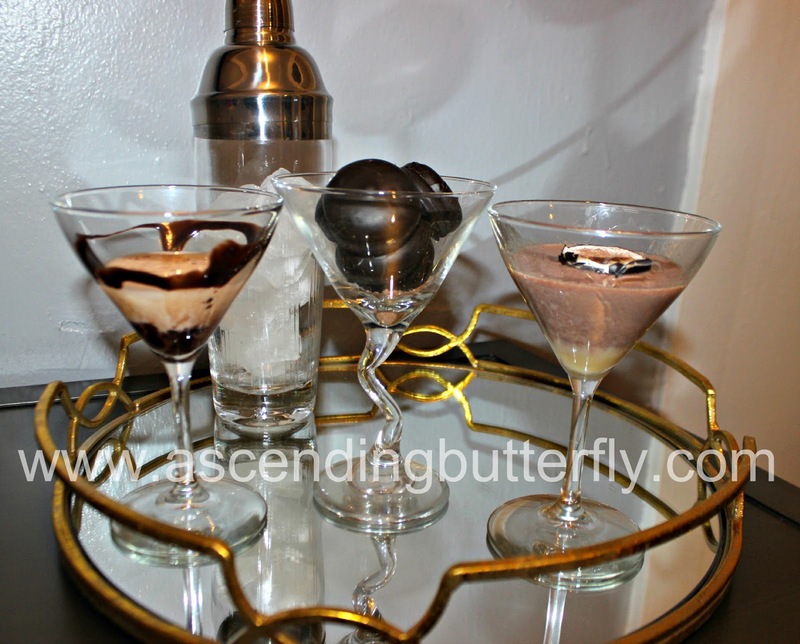 I am always game to try something new and I like that the Chocolate Martini lets you mix things up a bit. And you can make them to suit your mood, sweet or powerful! What is your favorite specialty cocktail? FTC Disclosure: This is a sponsored and compensated post, and all opinions are 100% my own! I am a member of Cost Plus World Market Ambassador Program. I am disclosing this in accordance with the Federal Trade Commission 16 CFR, Part 255 - Guides Concerning the use of endorsements and testimonials in advertising, you may check our Giveaway and Disclosure Page for additional information regarding Ascending Butterfly Disclosure. Oh my goodness this sounds so amazing! I will definitely be making this soon! And I love that mirrored tray!